The headquarters of the Franciscan Family Apostolate is located in Madison, Connecticut. Alan J. Ouimet, O.F.S. is the founder – president and is assisted by a small staff of volunteers. All the transactions of the Apostolate including assignments and funding of families are done at this location. Trips to India are made regularly by Mr. Ouimet or other board members, often accompanied by sponsors, to personally visit the poor there and to coordinate with the staff in India. The FFA is governed by a board of directors that meets annually. Alan joined the Secular Franciscan Order in 1967 and consequently founded, four years later, the Franciscan Family Apostolate (FFA) to assist the destitute poor in India in 1971. A native of New York City he graduated from Saint John’s University with a BA; he later earned his MA from the University of Connecticut. When Alan started his work helping the poor he was employed as a Special Agent of the Federal Bureau of Investigation (F.B.I.) He retired, after 31 years in 1988, to give full attention to the FFA. Since his retirement Alan was a founding director of the Connecticut Urban Education Foundation which assists educating at-risk children in New Haven’s inner city; he was a founding director and chairman of the Heart 2 Heart Foundation, USA founded to care for HIV/AIDS children in Kenya; and was a trustee on the Board of Trustees of the Society of Former Agents of the F.B.I. Foundation assisting members of the F.B.I. family with financial and educational needs. 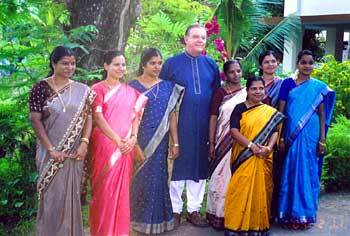 Alan has been honored with several awards for his work among the poor in India. In 1987 he was awarded the Bene Merenti (Well-Merited) Award by Pope John Paul II; in 2003, the Humanitarian Award of the Society of Former Special Agents of the F.B.I. ; he was a nominee, in 2010, for the Saint Francis Peace Award of the National Fraternity of the Secular Franciscan Order. Judith Warner became involved with the Franciscan Family Apostolate through her aunt, Mary Catherine Storms, who was one of the first sponsors in the FFA. She has visited India a number of times. Judy worked in the field of conflict resolution and relationship for twenty-five years. She lives in upstate New York with her husband. Mary was the reason the FFA began. She became ill. Alan prayed that her illness pass and joined the Secular Franciscan Order resulting in his involvement in India. She has been with Alan from the start, is a member of the Board and the principle bookkeeper for the Apostolate. For many years, they ran the FFA from their kitchen table, under the auspices of the Secular Franciscan Order. Because of the growth of the Apostolate and the need to insure its future, it was incorporated and determined to be a federally tax exempt 501 c(3) charity by the Internal Revenue Service (IRS) in 1989. Mary graduated with a BA from St. John’s University and was awarded Masters Degree in Education from Southern Connecticut State University. She is a retired Social Studies teacher and actively involved with various community organizations. Mark was raised in Madison, Connecticut and graduated with a BS from the Southern Connecticut State University. Mark has led a successful career in the financial services industry for nearly 20 years. Presently, Mark is the Director of National Sales for ProShares, Inc., a leading provider of ETFs (exchange traded funds).Mark is married and resides in West Chester, Pennsylvania with his wife Anna, and their two daughters. Mark is an avid fitness enthusiast who, in his spare time, enjoys quality time with his family, mountain biking, and motorcycling. Matthew, like his brother Mark, was raised in Madison, Connecticut. He graduated with a BA from Indiana University and and MA and Ph.D. from the University of Washington. He is the author of The Rise and Fall of the Brezhnev Doctrine in Soviet Foreign Policy (UNC Press, 2003) and works as a Senior Analyst at the U.S. Department of State. Matthew, his wife Julie and their three daughters reside in Virginia. He is an Oblate of St. Benedict and has served for several years as the Prior of Oblates at the monastery to which he is attached. Matthew has enjoyed the world of entertainment all his life. He is a performing conjuror specializing in historical and international magic. In his spare time he enjoys running and playing the Irish whistle. If you would like to sponsor a family through one of our programs, please click here.